The Android 2.2 upgrade for the Dell Streak is finally available. But only unlocked Dell Streak will be seeing the update first. OTA updates will be available to customers who purchased their Streaks as unlocked units. The update has officially started yesterday, and will be available by regions. Most unlocked units are in Europe, so updates will start there initially. So don’t get worried if you dont see the update notification right away, Dell says the update will continue through the end of November. We all know the Android update routine by now. But if you are really impatient you can manually check by going to Settings > About Device and selecting System Updates. Since the Dell Streak is the last major device to make the jump from the now ancient Android 1.6 (some of you do have Eclair) to a newer version such as Android 2.2, you will see a bunch of significant improvements. The biggest being the updated Dell Stage Interface with launcher and widgets. 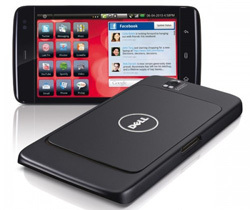 It will also include the new Dell Mobile Synch. It will replace the old syncing software, and a desktop version must also be downloaded. Now I’m sure most of you own a carrier branded Dell Streak (AT&T), and are wondering if and when you will be seeing a Froyo update. Well you will have to be a little more patient. Carrier-specific units will start seeing the update sometime in mid-December, but in the end it’s essentially up to the carrier to decide when the update begins.